CARLIE de Murga counted the days since he injured his knee a year and two months ago, eager to make his return to competitive action. When he finally did on Sunday night, the Filipino-Spanish standout was relieved that he could finally stop counting. “Four hundred fifty-eight days,” De Murga said without batting an eyelash after Ceres-La Salle outlasted Loyola Meralco, 2-1, to kick off their respective United Football League Cup campaigns. 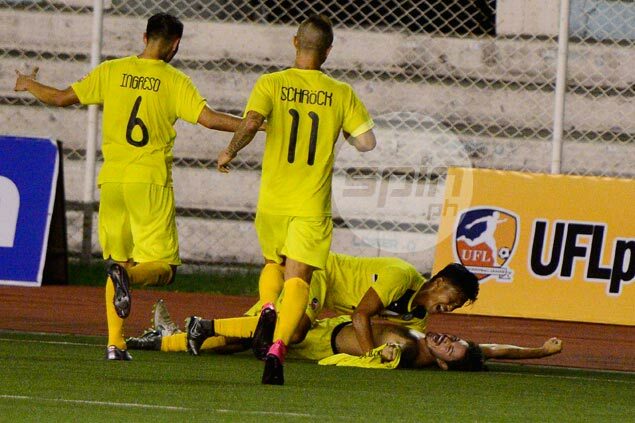 The former UFL Golden Ball winner had been sidelined since November 6, 2014 when he tore the anterior cruciate ligament (ACL) in his left knee during a collision with a defender early in the UFL Football Alliance League Cup finale against Global FC. Since then, De Murga patiently waited to make a comeback, which suffered a setback after his surgery was unsuccessful. “I got crazier by the day,” the 27-year-old utility man said. It even came to a point where his doctor hinted it was time for him to retire, an advice he refused to heed as he underwent another surgery, which fortunately proved successful. “The doctor told me to quit, but I never lost faith,” De Murga said. And it seemed like the 5-foot-11 right-back never left as he registered a brace in his first game back, following up Adrian Gallardo’s saved penalty in the 35th minute, before heading home the winner off a corner three minutes into second-half stoppage time. “I think he's just going to get better when the time comes, but for now I'm satisfied with how he plays,” he added. After making successful club comeback, De Murga is setting his sights on returning to the Azkals pool.